Snorkeling, surf and sun salutations? Yes please! Join us for a yoga retreat Panama style and soak up the hum of the city coupled with the best of eco-lux beach living. 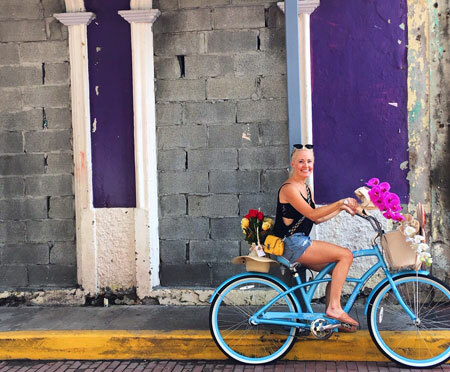 Panama is an ideal location for a soul-inspiring wellness vacations – you can soak up a delectable mix of cultural adventure, yoga and multi-sport inclusions to rejuvenate and reconnect mind and body. One of our top yoga retreats, our island home-away-from-home of Bocas del Toro will take your breath away with its gorgeous beaches, bath-water-warm ocean snorkeling and unparalleled sunsets. Balance historical-laden Panama City bookends with the heart of the week in eco-luxury bliss on beautiful Bocas del Toro. All you need to do is unroll your mat and sink into a Caribbean retreat. As one of Latin America’s best yoga retreats, Panama’s city and island beauty won’t be a secret for long! How do we unite a beautifully enriching cultural experience with our spiritual practice? Join Amanda for this unique time spent in one of the most stunning locations in Latin America. Make time to begin each day in gratitude and prayer with a vigorous morning yoga practice and grounding meditation. Embark on afternoons filled with exploration, historical excursions, and lots of beach time for swimming, surfing and snorkeling. You’ll have time for it all! End the day soaking in the stunning sunset with quiet movement to soothe the senses plus time to reflect and journal. This retreat will take you from city life to beach living and hope to connect you to the heart of your practice so that it can accompany and enhance your travels and experience. Leave recharged, enriched and spacious. Reveal the underlying intention that sanctity and sweet reverence can frame much of what we do. If you’re a person looking to enrich this lifetime in a unique and transformative way, look no further. Join me and a group of fabulous people for a week in cultural and literal paradise you will never forget. Join Elizabeth Rowan as she returns to a personal favorite retreat experience that offers the best of both travel worlds in one unforgettable week: historic city and serene island life in Latin America. With arrival and departure nights in the historic, pastel Casco Viejo quarter of Panama City and the week between spent on surf-vibe island of Bocas del Toro, this is attainable adventure-meets-relaxation. Expect yoga two-a-days with vinyasa and meditation mornings, and restorative, meditation, ritual and reflection by night. Elizabeth’s teaching approach incorporates philosophy, humor, ritual, and heart ~ and past Panama Oms have been joined by nearby monkeys in our treetop studio for a profound experience of connection. Travel, tin roofs and transformation await. To me, nature is the ultimate playground. The more we allow ourselves to let go and find freedom in the natural beauty of the world, the deeper is our connection to everyone and everything. Practicing yoga in this incredible country as we explore its beauty will be nothing short of transformative and liberating… and totally worth it! We’ll explore city life and Panamanian culture, tour the Bocas del Toro archipelago via sailboat as we explore and snorkel through the bluest of blue waters, experience incredible jungle wildlife (think: howler monkies and sleepy sloths), and catch the magic of living on island time! Practicing on our very own jungle top yoga shala overlooking where the jungle meets the sea, our mornings will begin with mindful and energizing alignment-based vinyasa classes, which will lead us right into a day filled with adventure and relaxation. The evening classes will include restorative yoga, pranayama breathing, yoga nidra and meditation to soothe the senses and assimilate our experiences from the day. Experience an incredible week of relaxation, renewal and freedom as we explore the beautiful wonders of the isthmus of Panama and the islands of Bocas del Toro! Would you like this new year’s celebration to be an opportunity for positive growth, a time to clarify your vision and focus your INTENTION? Would you like to start the new year of 2020 with a mantra of ‘I let go of what no longer serves me so I can flow in the direction of my dreams’? Would you like to welcome in the new year dancing on the beach with sand between your toes surrounded by the sounds of ocean & the support of kindred spirits? If your answer is yes, this retreat is for you! The word “Intention” comes from the latin ‘intentio,’ meaning “a stretching and directing of the mind towards your soul’s purpose. Living “intentionality” means to be purposeful in our actions, to see clearly our goal and to let go of the barriers to that goal. During this week, we’ll use the transformational tools of yoga (vinyasa flow, philosophy, meditation and breath work) in the sumptuous backdrop of Panama to step into the new year with renewed vision, energy and joy. This will be my 10th trip with The Travel Yogi and my third trip to Panama. Why am I returning for this New Years? Because I KNOW what lies ahead. Off the mat, you’ll find the venues, excursions and dining experiences amazing! On the mat, what could be better than yoga “two-a-days” in a beautiful jungle yoga loft overlooking the Caribbean. As one guest described the sweet walk up the stairs, let’s name this place “100 steps to Transformation”. My experience of leading retreats and teaching yoga (for over 40 years!) has given me a full tool belt of modifications, inspirational philosophy and stories to make this all levels retreat inspirational for both the beginner and those who want to take their practice deeper. I’m super excited to step into the new decade of 2020 with you on this retreat of so much promise and opportunity. Get ready for barefoot elegance, island style. Each Island Plantation room is designed and decorated with natural comfort in mind. All rooms have gorgeous open-air bathrooms, front pool-facing patios, overhead fan for evening comfort (though the ocean breezes keep you cool) and a zen style that eases you into ‘island time’. Please note that hairdryers are persona non grata on Bocas so be prepared to let your locks flow au naturale mid week. Teachers will set their yoga schedule, generally mornings and evenings, prior to departure. Schedules will go out with final yoga retreat information to our Panama-loving traveling yogis. Panama was an epic time... Flawless execution! ...the Panama trip last week exceeded my expectations and was absolutely incredible. The organization was so well done and it was clear that your team puts a lot of research and effort into planning a great retreat for the attendees. I travel quite a bit for work and leisure and this was just extraordinary. One of the best vacations I have ever been on. The catamaran trip in Bocas was absolutely fantastic. Everything was planned well and the trip suggestions were spot-on. I can't complain about anything, this was a fantastic trip! Honestly, I went on a retreat last year that I thought was the best trip ever I had taken for myself. Then this trip blew the last one out of the water. It was the people... I met such wonderful new friends and then Gia, who was just amazing. And the location was gorgeous, with abundant nature and adventure around every corner. This trip fulfilled all my desires - spiritual exploration, sense of community, adventure, beauty, relaxation, physical wellness and more. This trip was one I'll always remember, one that left me richer in spirit, mind, body and heart. Thank you! The group could not have been better. To be able to meet people from all over the country that are on the same wavelength and got along as good as we did was really special ... The "city" time at the beginning and end was perfect, too, as a great way to transition in and out of the country. The overall blending beach, jungle, historical and city experiences into one week made this a perfect full Panama experience. Really well planned! I was impressed with how smooth the reservations were handled and I had no glitches at all. I especially appreciated the promptness of the drivers to and from the airport. As a woman traveling alone I felt safe and taken care of. Thank you for an amazing experience. US citizens will need a passport to visit Panama, but no visa is required at this time. All passports will need at least three months validity beyond the date of entry and at least one blank page for entry stamp. As this information can change, for up to date entry requirements please visit the State Department’s Panama page. Nationals of all other countries should check travel requirements with their government well in advance of travel. Please fly into the Panama City international airport (PTY). Transfers will be arranged from the airport on arrival and departure days only. Arrival transfers will only be offered for flights arriving before 3pm on arrival day. How far is the schlep from the airport in Bocas? The Travel Yogi has you covered when it comes to your domestic flight! We’ll get you all to the Albrook airport for the quick 50-minute flight to Bocas del Toro. From there it is approximately a 30-minute drive to our location. We’re giving you the best of city life as well as the secluded charm of the island. Only about 15 minutes of the drive is on a paved road, with the last half going a bit slower on a dirt road with the ocean on your right and tropical lushness on your left. Our awe-some Bocas beach paradise has your yoga retreat needs covered. Blocks, mats and straps are all supplied and ready for you to breathe into your practice this week. Absolutely. In Panama City and on Bocas you can be as wired, or unwired, as you’d like. Naturally! Of course, there is the gorgeous Caribbean with options ranging from surf waves and rolling waters to the still bath-like waters of La Piscina. Or, if you want to forgo the ocean exploration, you can relax just outside of your room at the pool. Can my dietary needs/restrictions be accommodated? Absolutely. Dietary requests can be accommodated provided that you notify us at least four weeks in advance. There will be vegetarian and non-vegetarian options at each meal, so you can choose your own culinary adventure. Do I need to book any optional excursions ahead of time? Whether your decide to surf all week or gallop off on a steed, there is more than enough time to book these excursions when you arrive. There is so much to absorb that it’s best not to book before arrival and, especially for the surf, you’ll want to get the local report first. See what you feel like when you reach the good life and don’t forget to block off some chill time. What is the electrical currency/outlet situation in Panama? Our friends down south utilize the same plug and voltage as the United States and Canada. If you are coming from another part of the world, a plug adapter and/or converter may be necessary. Please note that our island location has their own power grid and hair dryers and similar small appliances are not allowed as they’ll (temporarily) blow the system. Take these few days to embrace the au-natural look and spend that would-be hair-prep time swimming, exploring, relaxing or expanding your practice. Like all beautiful tropical location, yes, there are bugs. While we do recommend that you take a mozzie spray, the natural ocean breeze generally keeps these guys at bay. Although we don’t recommend you book excursions ahead of time, you’ll want to think ahead a bit when it comes to packing. Treks and horseback riding will require close-toed shoes (ie, not flips or sandals) and a few pairs of long pants won’t go amiss. Your essentials will be your yoga clothes and bathing suit with the rest depending on your appetite for adventure. Quick dry clothes will work best and we will, of course, send out a packing list prior to departure. Remember, as noted above, leave those hair dryers at home! Bocas has it’s own microclimate that can be quite different from other areas of Panama. The trade-off for some of the rains is also a green, tropical lushness that is unique to these islands. The average daytime temperature is almost always in the low to mid 80s with evening temperatures consistently staying in the low to mid 60s. The ocean temperature is also consistently, and beautifully, in the low 80s (nice!). November, December and January are the wetter months while September leads off as the driest month followed by October, February and March. After I book can pay my deposit, can I make payments on my yoga retreat?